Is online video part of your marketing mix? I’m sure that most people agree that getting in that game is easy and inexpensive. With cameras such as the Flip (or even the one in your smartphone), companies can create fairly high-quality videos in just a few minutes. And, they can upload and have them hosted for free. But does it work? Is it worth taking the time to decide who will be in the video, what you will talk about, and when it should be done? Is it worth breaking into a sweat stressing about how you will look on screen? 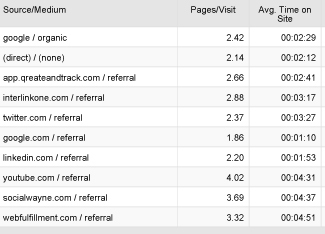 Below is a screenshot from a recent Google Analytics report that I ran for QReate & Track. It lists the top 10 traffic sources for that site. Check out YouTube — not only is it in the top 10, but people that clicked through after watching a video viewed the highest number of pages per visit. Is online video helping drive traffic in both quantity and quality to your site? ← The Iron is Hot. You Can Touch It.